I have seen a lot of genré films in my life, but there are some that inevitably escaped my attention - note that I'm talking about the movies of days past, not the current astounding glut of direct-to-video horror and sci-fi that choke the new release shelves of your local BlockWood video store, which are so numerous I'm not sure anybody can keep track of them all. Possibly they are what I'll be writing about with fondness in the year 2025. 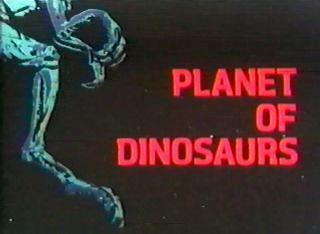 But we're here today to talk about Planet of Dinosaurs, which I had only heard of a few years ago, but bears a production date of 1978. 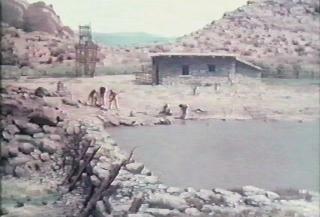 Hm, 1978. What was I doing in 1978? Oh, yes, eating as many drugs as I could get my hands on. But I still would have noticed a movie called something like Planet of Dinosaurs. That's my job. It's what I do. After all, according to the video box*, this movie won the prestigious "Science Fiction Film Award". It seems well-nigh impossible that I could miss a movie that won the coveted "Science Fiction Film Award". Unless that was the year that Corey Feldman did that Michael Jackson production number at the awards ceremony. That alone would have caused that particular memory node in my brain to commit self-immolation, just to protect the future of the species*. Lee (Louie Lawless) - the ship's captain. Derna (Derna Wylde) - Harvey's secretary and girltoy. We know this to be the case because she's the only female character with a bare midriff. Well, our eight castaways dry off on the shore of the lake and take stock: they managed to get off the shuttle with a few cases of equipment and four lasers. Cindy, however, left the emergency radio on the sunken ship. This points up a strain of ineptitude and stupidity that will run throughout the picture - though Lee constantly makes the statement that they are technicians, not explorers, they are pretty stupid technicians. Harvey, the Spaceways, Inc. Vice President is not exactly the brightest diode in the display, either, as he keeps asking Capt. Lee why he doesn't just call somebody and have them picked up (Mike, who will later earn my unwavering scorn, responds to this with, "This isn't Nebraska!" I kept expecting someone to get sick of Harvey and punch him out - more fool I, as I didn't really need to set myself up for more disappointment). Nutbunnies! Where was I? Oh yeah. Cindy tries to make amends by mentioning that the radio should float (I assume she means the case the radio is in) and Chuck, the Muscular Navigator, doffs his shirt to plunge into the lake in search of the device. Cindy immediately follows. Bad move, Cindy - you were such a bad actress it was quite obvious that you would be the first to die. Some scaly Muppet in the lake drags her under (while the bargain basement synthesizer score shamelessly rips off Jaws). Remember what I said earlier about only eight being around to torment you. Chuck manages to swim back through the bloody water to safety, but will spend the next several scenes in a state of shock, and will never again put on his shirt. As a memorial gesture, I guess. It is decided to move inland, just in case the Cindy Eater is amphibious. Derna and Mike bring up the rear as the party crosses through some swamp; the secretary is being understandably reticent about walking in water, seeing what happened the last time a woman and some water intersected. Mike decides to calm her down by letting her carry his laser. Okay - my general way of dealing with occurrences in sci-fi movies is to attempt to come up with some present-day analogue: hysterical woman doesn't want to cross river because there might be piranha, and National Guardsman hands her his fully loaded M-16, with the safety off. I certainly don't want these two behind me in line. Well, Derna slips and falls in the river, soaking the laser and rendering it useless (what? Did the powder get wet?) . 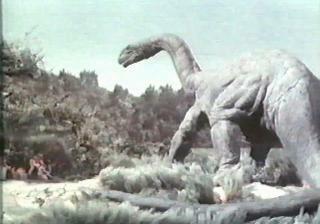 The next morning, our heroes are surprised to wake up and discover an Apatosaurus grazing nearby (actually, it is a Brontosaurus, as back in 1978 there were still such things as Brontosaurs) - it is theorized that since the planet's environment is so similar to Earth's, a sort of parallel evolution is taking place. It's a very homogenized sort of parallel evolution, as we will be running into beasties from many different eras, from the Jurassic through the late Cretaceous. Speaking of the Jurassic, Charlotte, during a rest, is scanning the local flora for edibility when she is surprised by a charging Stegosaurus. Showing the level of professionalism and capability which will become the hallmark of this crew, Charlotte throws her tricorder up in the air and runs away screaming, followed by the others when an Allosaur joins the party. Mike, however, has left his laser behind (what? They gave him another one?) and must risk life and limb to skirt the two dueling stop-motion puppets - twice - to retrieve it. The spiketail winds up on the buffet and Lee decides it would be best to climb the nearby plateau, where he figures the large predators can't or won't come. Fellow Mystery Science Theater 3000 fans will recall the episode - King Dinosaur, as I recollect (I recollected wrong - it was Lost Continent, and thanks to 3-B Theater for gently pointing out my error)- where Dr. Forrester and TV's Frank tormented Joel and the Bots with smug utterances of "Rock climbing, Joel.... Rock climbing." 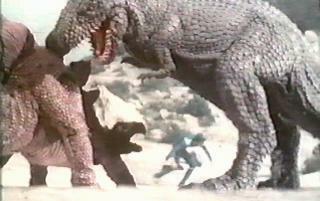 Whereas Planet of Dinosaurs is not so bad in the endless padding department as King Dinosaur (Lost Continent!) , permit me to say: Rock climbing, audience... rock climbing. During the seemingly endless climb, Nyla slips and nearly falls to her death, but is grabbed by Jim, who continues to demonstrate that he is possibly the only competent member of the crew. Unfortunately, this means that Nyla's laser and the case containing all the survival rations plummet to the rocky ground below. VP Harvey tries to order Lee to send someone down to reclaim the food, but the captain instead insists that they will find food on the plateau above. Ah, I think, Battle of the Network Idiots. Yes, there is hopefully food on the plateau. But the tossing off of the only rations - not to mention the spare parts the remains of the laser might afford - is pretty (you guessed it) stupid (Fortunately for the late 70's hairstyles of the men and women, the case containing the blowdryer is still intact). Speaking of Harvey and the less-than-sure-footed Nyla, they scout ahead and Harvey demonstrates why his company hires crews full of idiots, when he finds a nest of huge eggs and assumes there is a giant chicken nearby. The chicken in question turns out to be some form of Styracosaurus - think Triceratops with only the nose horn - and Harvey grabs the laser from Nyla (what? they gave her another one?) and shoots it... hitting the bony frill. Which just makes the critter mad. Harvey fires again, and the shot goes over the dino's head. The thing is the size of a delivery van. It is running toward him, presenting a constantly growing target. HOW THE HELL DOES HE MISS??!! Well, he does, and winds up a hood ornament on the dino. After burying Harvey (and the next-to-the-last laser, I suppose), our dwindling supply of actors finds a defensible spot and Lee orders them to start building a stockade. It's at this point that Jim starts making noises toward being Alpha Male - he feels that rather than cowering in a cave, they should be on the plain, actively hunting the dinos and teaching them that the little hairy bipeds should be feared. Still, he defers to Lee as he is the Captain, for the moment. Time passes, and the stockade is slowly completed - incidentally, one of the flimsiest excuses for a wall I have ever seen, even in a low budget movie - I mean, some angled stakes or punji sticks would have been nice - and upon its completion, Mike breaks out some berry juice he has been fermenting, and everybody gets smashed, except for the gruff Jim, who stands guard with a certain amount of bitterness and disdain. Derna does "The Dance of Desire", and everybody probably gets laid. But not on camera. During the construction, Nyla goes scrounging for flint, as they're also making spears, arrows and stone axes, and runs afoul of a stop-motion spider the size of a footstool. 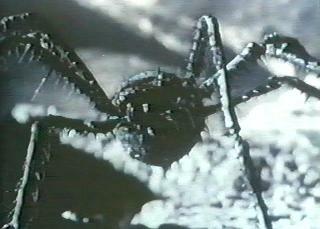 Jim spears the offending arachnid, fixes Lee with his gruff glare and snarls, "Safe, huh?" Later Chuck (who is more lucid but still shirtless) is setting out reflective materials to help the hoped-for rescue mission to zero in on their location; Charlotte joins him and attempts to make some time with our bare-torsoed beefcake. Wandering off, she is attacked by an Allosaur (points go to Charlotte, however, for actually throwing dirt in the beastie's face so she can run away). Chuck comes to her rescue, first spearing it, then bravely waving his knife in its scaly face. Luckily, the rest come in response to Charlotte's screams and Jim lases the monster in the back, scaring it off (for lasers the size of rifles, these things seem to pack remarkably little punch). Jim then fixes Lee with his gruff glare and snarls, "Safe, huh?" I think you see the emerging pattern. The rest are ready to fall in behind Jim and chase after the Allosaur, brandishing their homemade weapons. What they don't know is that the Allosaur is no longer a problem, as it has run into a hungry T. Rex (there is no professional courtesy on the Planet of Dinosaurs). That night, the T Rex smashes through their flimsy excuse for a barricade; everybody scatters except Derna, who goes back for the last laser and winds up dino kibble - presumably taking the laser with her, because we never see the useless thing again. At least Jim doesn't say, "Safe, huh?" 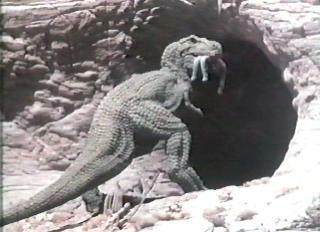 Jim and Lee track the T Rex to its lair - a nearby cave - and consequently set to arguing about how to deal with it. Jim, of course, wants a full frontal assault, but Lee wants to try poison bait - Charlotte, before she threw away her tricorder, identified a local berry as poisonous. This time, the crew lines up on Lee's side - they hunt and kill a baby Stegosaurus and load it up with the poison berries. The major flaw in their plan is not posting a watch on the cave - when they're transporting the carcass up to the cave, the T Rex isn't in it, it's behind them, and it makes a tasty snack out of Mike, who had run out of lasers to lose, anyway. This affects our two alpha male candidates in different ways - Jim throws himself into his T Rex Trap Project, and Lee wants to just move to another plateau, out of the Rex' hunting grounds. This almost leads to the fight which has been brewing for half the picture, but this slice of drama is interrupted by the immanent arrival of the big saurian before the trap is completed. Lee makes amends for his utter wussiness by running out and distracting the Rex with a signal mirror. 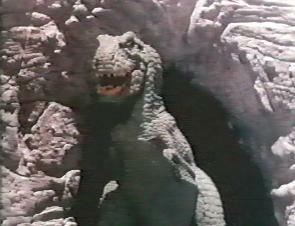 He leads it into a fight with another dino, which I have dubbed the fake-asaurus - it's apparently a cute little tribute to Harryhausen's Beast from 20,000 Fathoms. The trap completed, our plucky crew attract the Rex's attention by the simple expedient of yelling wugga wugga wugga at the cave mouth, then running like hell (Nyla, of course, trips, but has enough sense to hide behind a bush) until the Rex blindly impales itself on an enormous wooden stake coated liberally with their homemade toxin. Hooray! Now we cut ahead three or four years - Jim's beard has gone white, Lee has grown one, and Charlotte is mother to a boy child; They've fenced off a portion of the plain near water and a stone house is in evidence in the background; everybody wears leather clothes and looks quite native. Charlotte looks up at the sky and asks, "Do you think we'll ever be rescued?" Nyla smiles and answers, "It doesn't seem to matter much, anymore." The end. Probably the first question to be asked about a space-faring SF flick is, how are the special effects? Well, the ship model is pretty good, though the flight scenes - very few and very brief - are nothing special, and at least the quality of, say those in Dark Star. The stop motion dinosaurs are very good - if you're watching the opening credits, you'll notice a couple of familiar names, like Doug Beswick and Jim Danforth in support of FX wranglers Jim Aupperle and Stephen Czerkas. There's the usual problem with mixing stop motion with live action - the models are in sharp focus while the people are fuzzy and a generation or two down, image-wise. 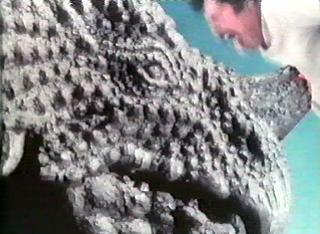 You'll even see this in Harryhausen flicks, but it's even worse here, as the film stock seems to change between normal and FX scenes, the contrast and colors varying greatly. But I'm afraid it's our old pals, the script and the actors who do the most damage to Planet of Dinosaurs. While the script has an interesting arc in terms of the evolution of our group of "technicians, not explorers" into a hunter-gatherer tribe, it rarely plays fair with the characters in terms of the constant stupidities they must commit in an attempt to either generate some tension (note I said "attempt") or move the story along. Attempts (there's that word again) are made to bridge the action setpieces with quieter, human moments as the castaways try to find comfort and forge relationships with each other - the writing here, while it doesn't ideally sing, isn't awful, but sadly the acting - which ranges from the simply awful to the hardly average - merely serves to make these moments leaden and painful, and the direction is certainly not good enough to compensate. In short, once again we have a story with interesting bits and pieces that is sabotaged by a budget far below its aspirations, shot - apparently in 16mm - with a cast of non-professionals that only serve to drag the sub-standard picture quality down even further. This story should be far more compelling than it is; the elements are certainly all there, possibly only lacking a director or producer of sufficient strength and canniness to cause these elements to play to whatever strengths his actors might have had. This might have enabled the picture to become a good little B flick of its own, rather than the sad little wanna-be it actually became. It's a sad state of affairs that I spent most of the writing of this review trying to shoehorn in a "voting off the planet" joke in honor of America's current fixation on the CBS "Survivor" series. I never really managed that, but I did become enamored of the concept that in a war with another group of castaways, the denizens of Gilligan's Island would kick these moron's asses. At least my two year-old liked the dinosaurs.